Lauren Spence is a 4th grader studying violin in the West Music Lessons program with Gayla Drake. 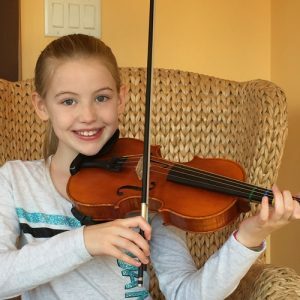 She has been in lessons for over a year and has made great progress on her musical path! When not playing violin, Lauren enjoys dance (aero and tap), spending time in her church group, writing, drawing, cooking and singing. Her favorite music is Irish jigs. “Irish jigs make me feel happy! I love getting new songs to play!” Her favorite musicians are Gayla Drake, Lindsey Stirling and Celtic Woman. She is a citizen of the United Kingdom, Ireland and the United States and travels to visit her family in Northern Ireland every summer. Lauren also enjoys time with her hamster, Bert and her bunny, Ginger.